After the screening at the Hong Kong Science Park this spring as part of Hong Kong ArtWalk Extra this spring, the international video project Translation(s) curated by Laurence Wood and Zoran Poposki will be presented in the official programme of the 11th edition of ART STAYS International Festival of Contemporary Art in Ptuj, Slovenia, from July 24 to September 1, 2013. ART STAYS is one of the most active contemporary art institutions in Slovenia today. Since 2003, ART STAYS and its International Festival of Contemporary Art has played a leading role in bringing an international vibrancy to the city’s art scene, showing for the first time in Slovenia the works of artists such as Fernando Prats, Ivan Navarro, Yoko Ono, Leo Ferdinand Demetz, Regina Jose Galindo, Ilona Nemeth, Elisa Rossi, Kensuke Koike, Angelo Volpe, Igor Molin, Raphael Di Luzio, Florian Langemaack, Tim Roeloffs, Marek Schovanek, Sissa Micheli, Peter Wehinger and many others. 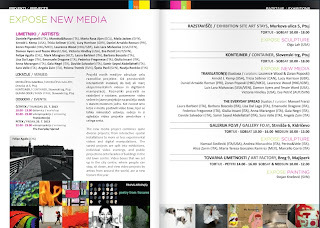 "2012 was a landmark year for the Art Stays International Festival of Contemporary Art. We celebrated our 10th anniversary and played an important role in the European Capital of Culture Maribor 2012, which brought much attention to the exceptional cultural offer of Ptuj. This year we are back with a programme full of new events: from local to international, from large-scale to intimate. The 2013 festival includes projects that outline the current situation in the world of contemporary, especially visual art. We named it EXPOSE on purpose, as we do not wish to give it a common thread other than to show the diversity of contemporary art of the world. The festival’s audience is varied and Ptuj is not a large city, so creating narrowly focused projects would not bring the desired results. Over 25,000 people visited the festival last year and we hope that the number will be even higher this year", says Jernej Forbici, the festival's Art Director.